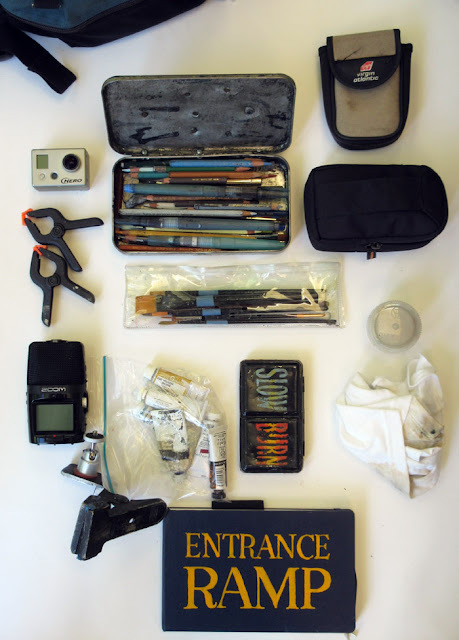 Here's what I pack in my bag for a sketching day at the Dutchess County Fair in Rhinebeck, NY. It's everything I need for sketching in watercolors, colored pencils, and gouache. 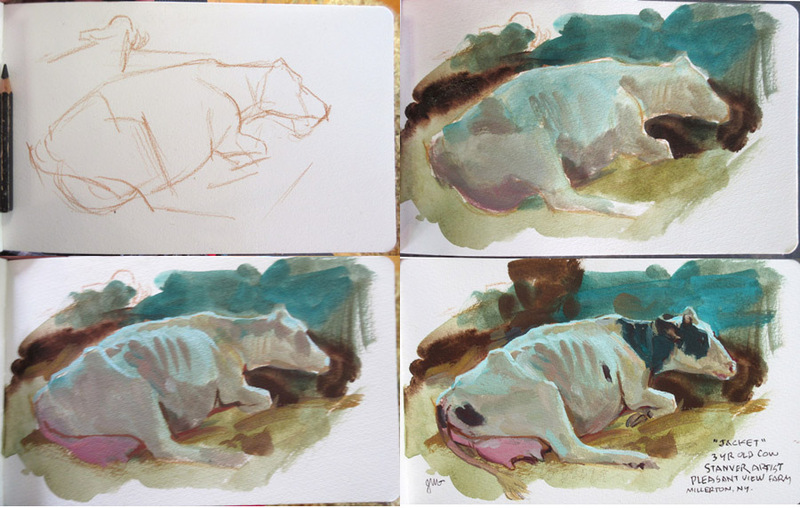 There's a 5 x 8 inch watercolor journal , plus devices for capturing video, stills, and audio. The audio recorder is called a Zoom H2n .All of this fits onto my belt. I start off in the cow barn, where the milkers are taking a morning nap before their judging. Without a chair, I paint standing. I use a limited palette of three colors of gouache: yellow ochre (Holbein), perylene maroon (Winsor Newton), and viridian (Winsor Newton)—plus white (M. Graham). Viridian serves as my "blue." I can get a nice black with the maroon and the viridian. By the way, this would be a good limited palette to try for the "Paint an Outdoor Palette on Location" challenge (link goes to Facebook page where you can see entries so far). 1. Underdrawing in water-soluble colored pencil. 2. A wet block-in without white approximates the final colors. 3. Introducing opaque white, and defining the forms of the body. 4. Dark spots and definition of small forms and details. In this audio clip (link to Soundcloud file), Jeff Pulver of Pleasant View Farm, describes what a judge looks for in a dairy cow. After the painting session, we watch the draft horse pull. It requires immense power for the team of two Belgian geldings to pull 8500 pounds of concrete. The Dutchess County Fair will continue through this Sunday in Rhinebeck. If you live nearby, check it out—it's the second largest fair in New York State, with one of the largest displays of farm animals. Cool. 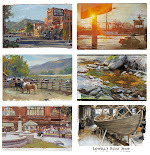 Unfortunately I'm missing the fair this year but I will be sketching at the sheep and wool festival at the fair grounds in October hope to see you there. I love the color of those udders. Your kit is remarkably compact. And, I must say thank you: last weekend I put together a little pile of stuff and painted outdoor for the first time ever. THANK YOU! Kudos not only for a great painting, but also -am I right that you did this standing without an easel? That reminded me of a pochade rig I saw once that was equipped with a strap that went around the back of the neck so that the pochade hung at belly height. Very simple yet (apparently) effective. Wow! That fair looks perfect, wish I could attend. Love the sketch, too!!! Would love to hear a more in depth explanation of how you managed the light/dark and warm/cool relationship on the cow if you'd ever be willing to! Thanks, as always, for the post! Admiring your skill in painting such a great study while standing. 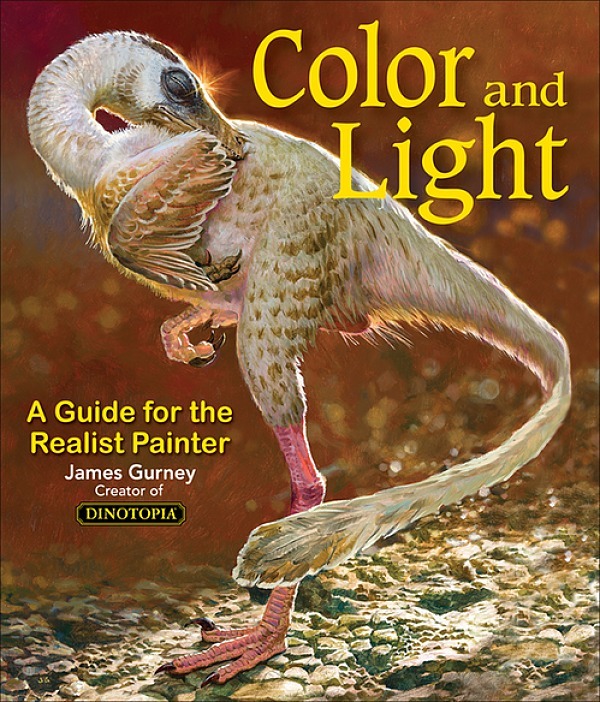 As a beginner, I'd be interested in knowing what kind of difference using a blue (say, ultramarine) would have made to the overall color temperature. Did you choose viridian to boost the chroma of the sky color casting on the cow? Fabio, thanks. I could have used ultramarine instead, but I only packed a few paints and I decided to take viridian. I didn't know when I left home what I would be painting. I deliberately choose new combinations of colors to avoid painting habits. Robb, the light coming in from under the eaves was blue skylight, and the fill light was warmer, from a yellow fiberglass skylight. I stopped and analyzed where all this light was coming from to understand it better. The hard part was that it was difficult to see the paper I was painting on because most of the light was coming in from under the eaves. Tom, yes, this is my most compact set-up that I might use in a Moroccan market, or anyplace where there's no place to sit. The whole palette is clipped to the left page, with the water cup held on by a magnet. Susan, so glad you're painting outside. You're so brave. Nathan, we'll be sorry to miss Sheep and Wool. Wonderful stuff as always. And always interesting to see the kit. I don't think I've seen the black 'zoom' device on the left of the photo, though. Can I ask what it's for? That brings up another question: can I ask about your opinion of modern smartphones for gathering the media you described? (Stills, video, audio) Have you used any for those purposes? Warren, the Zoom H2N is a digital stereo sound recorder that doubles as a microphone for video voiceovers. I'm no expert on smartphones, but I believe they're excellent for all the above, though I like the quality of the microphone, lens elements, and control interfaces of the dedicated units.